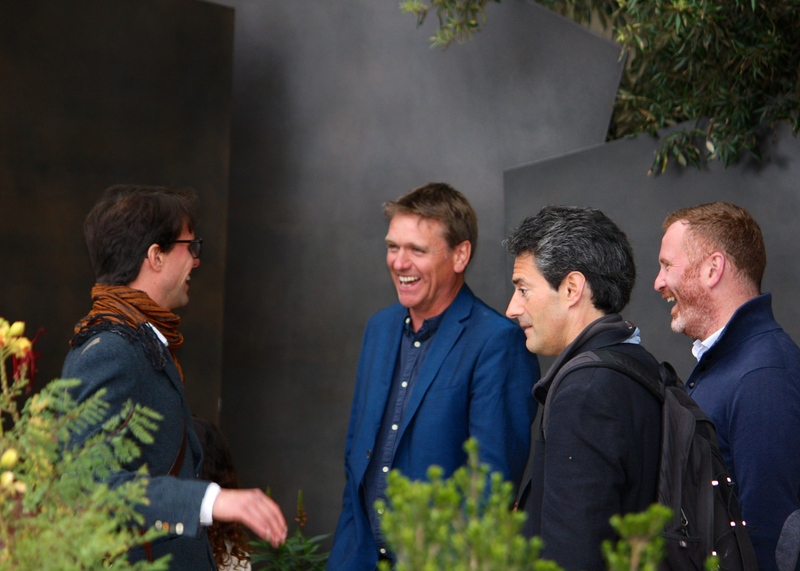 The problem with writing about The Chelsea Flower Show is that there’s so much to say and so little time to say it. And then there’s coming up with a new angle to share. The BBC’s coverage is so fulsome that one overhears almost every visitor to the show quoting little facts to one another as they thrust their iPads aloft to get “that” shot. “The designer collected the seeds himself from the Camargue and grew them on in Kettering you know” says Dierdre. “That’s the one over there with the Murano glass floor that broke Dierdre. How awful!” Marjorie replies. You get my drift. But aware that many of my lovely followers live overseas or, like me, don’t have a lot of time to watch the television or read newspapers, I am going to take time to describe those I consider to be the most interesting show gardens in a little more detail. On Saturday, Tim Richardson, gardening columnist for The Telegraph, candidly proclaimed the newspaper’s own garden to be odds-on favourite (3-1) for Best in Show at this year’s event. Having predicted correctly for the two previous years, he can now smugly lay claim to a hat-trick. With his jagged, Jurrasic, geologically inspired design Andy Sturgeon claimed a well-deserved gold medal and his second top accolade for his multi-media sponsor. I will begin by saying that I found this to be an impressive, sculptural and beautifully executed garden but, alas, not a loveable one. For me there were too many choppy angles and hard surfaces for the space to feel either comfortable or restful: I prefer my gardens on softer and cuddlier side. 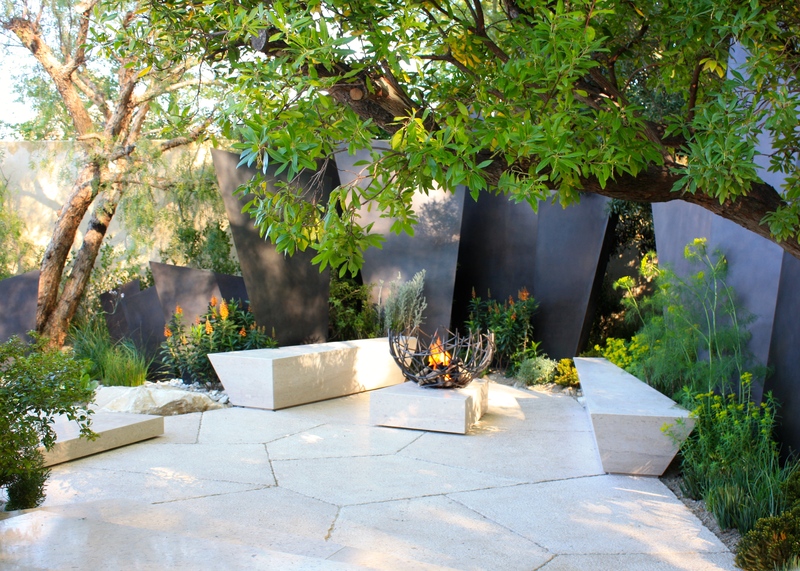 The only elements I could feel much empathy with were the plants (and then not all of them) and the bowl-shaped fire pit, which provided a focal point at the end of the plot. Practicality and commerciality are not things one should dwell on too much at Chelsea, but I could not envisage this garden in my own personal space, nor could I imagine how I might maintain it: weeding between rocks is not a pleasant task. In fairness Andy recognised that his garden might not appeal to everyone: “The garden’s monumentality and slight chaos may divide opinion, and it isn’t really related to anyone’s real garden, but Chelsea gardens ought to provoke and I wanted it to be dramatic and unexpected” he explained. Compared to its peers, Cleve West’s M&G Garden in particular, I found The Telegraph Garden lacking either sense of place or atmosphere. In Cleve’s garden one knew exactly where one was supposed to be and how to feel. There were birds singing and the mingled scents of woodland foliage and tiny flowers all around. It was utterly transportative and, in that respect, a triumph. 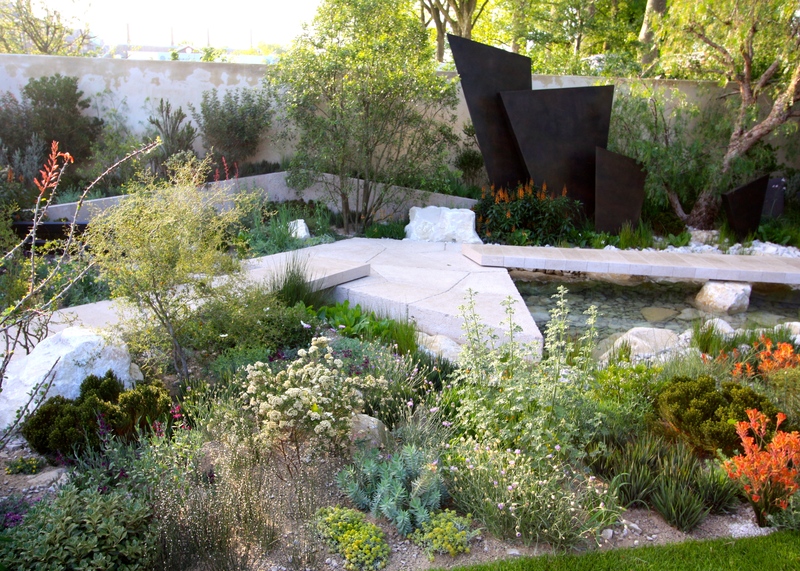 But in Andy Sturgeon’s garden there was very little that helped the average punter understand where this garden rightfully belonged, apart from on the RHS’s pedestal at Chelsea. There was running water, yes, although oddly disguised from view if one found one’s self standing at the front, and the fire bowl was eye-catching, especially in the evening. It may not have helped that so many other gardens this year positioned themselves somewhere very explicit, planting an obvious question of “where is this supposed to be?” in the mind. Andy’s ambition, and I am ashamed I didn’t rise to it, was that spectators would have the imagination to go on a journey back through time with him. A definite sense of prehistory offered something for us heathens to latch onto. 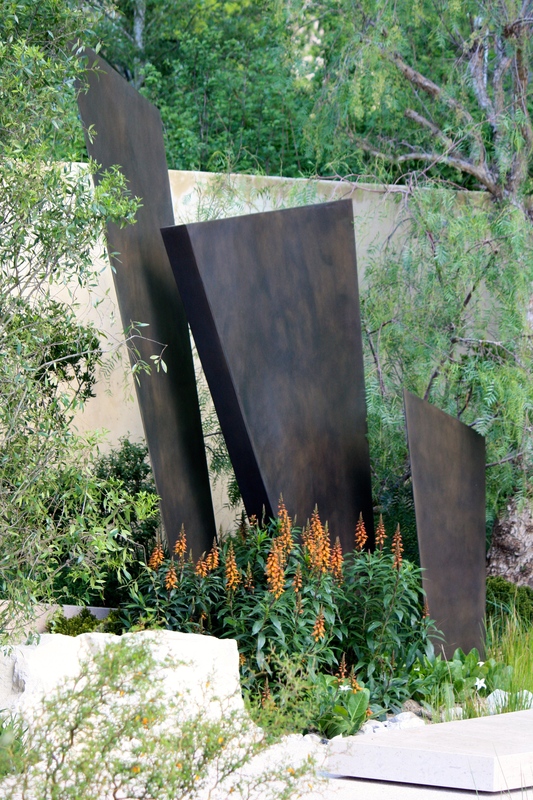 The garden’s procession of 17 bronze-coated metal wedges, representing a stegosaurus’ gigantic bony back plates, leant the composition an unmistakably Jurassic air. Thanks to Andy’s deft hand this idea was not taken to its theme-park limits and the choice of stone was made carefully, sourcing from quarries known for their fossil packed rock. It was a pity that the bronze chutes delivering water into a shallow pool were not especially visible and that the water body itself was not more interesting. Bubbling geysers or steam rising from the surface might have been taking things too far, but without more going on I found the feature a trifle bland. Andy Sturgeon understands plants and, most importantly, how to deploy them. His idea was not to recreate any particular habitat but to bring together plants from around the world that flourish in the same, Mediterranean climate. There were species from the Karoo in South Africa, alongside those from South America, California, the Canary Islands, Croatia and Italy. Many of the more unusual plants were sourced from a nursery in France specialising in dry habitat flora. They were transported to balmy Spain to keep them growing through the winter, before arriving in the UK in time for Chelsea. The selection of plants in the garden was artful, controlled and innovative but, again, not terribly approachable. I found it a little fragile and scrubby-looking, the sort of undergrowth that might scratch one’s legs. But I loved the way lusher plants had been arranged behind benches and near the water’s edge, suggesting they had found a niche in which they were truly happy. This attention to detail is the signature of great Chelsea planting and would have garnered all-important points. 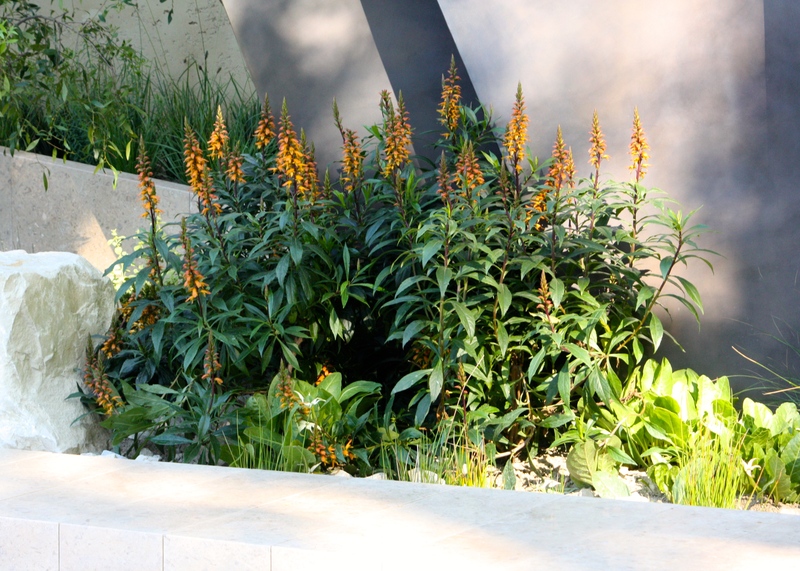 The stand out plant for me was one of my own personal favourites, Isoplexis canariensis (now Digitalis canariensis) which was the perfect choice for this garden. Not only did the hooded, copper-orange flowers look magnificent against the bronze fins, but they also echoed wonderfully the flames in the fire bowl. An interesting choice was Jaborosa integrifolia, a starry white flower from South America which was completely new to me. From the same part of the world, delicate Schinus molle (Peruvian pepper tree) created willowy veils of feathery foliage around the borders of the plot. In summary I found The Telegraph Garden interesting rather than beautiful, admirable as opposed to loveable and clever instead of compelling. But by no means was it unworthy of Best in Show, far from it; it just wasn’t my personal favourite. When one sets out to provoke, as Andy did, one must be ready to get a reaction. I’d love to hear which Chelsea garden inspired you most and if you took a different view of this year’s Best in Show winner. Hear about what inspired Andy Sturgeon in this short video with its amusingly cuddly and un-Jurassic soundtrack!. Yes, I second that. It is a user’s garden for office workers for example at the back of a big building not a gardener’s garden. I find that most of the gardens on display are just that either for a commercial outfit or for a homeowner who will have a team of maintenance gardeners keeping it in a perfect condition. No place for plantoholics, hands on gardeners nor a bulb theater which I prefer. I will try to cover some of the less formal gardens Karen, although cottage gardens were almost entirely absent this year. You would have liked Jekka McVicar’s Modern Apothecary Garden. That was a serious crowd pleaser, filled with herbs and flowers. Thanks Dan, for your great commentary. I was thinking The Daily Telegraph show garden would be the best one. Anyway thanks for telling us what isoplexis variety it was carnariensis. 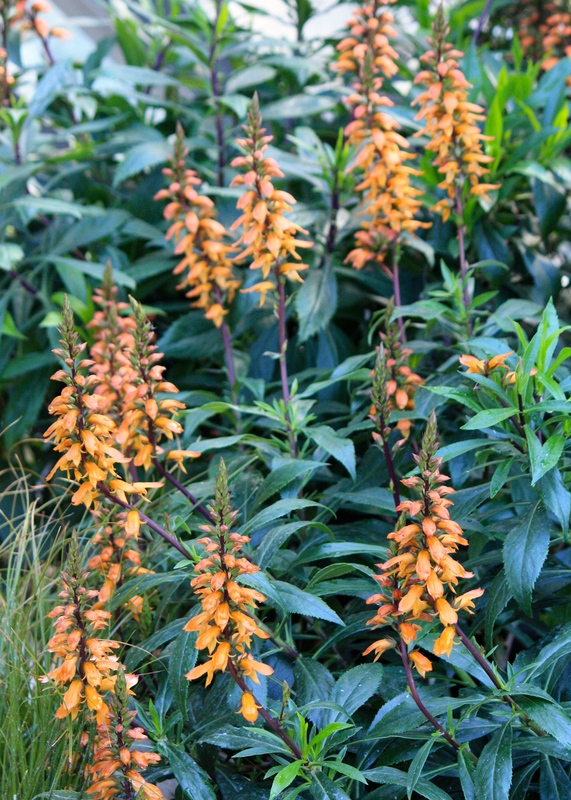 I could see the orange isoplexis flowers in your photos, but wondered what species it was. Thanks for your wonderful detailed descriptions of gardens. You are welcome Rodja. You should try the isoplexis – it will come from seed. Have a lovely weekend. More coming soon. I am setting myself the task of one a day whilst I am on holiday! Greetings to you in Brisbane. I was listening to a 30 minute programme on the radio yesterday about the train line between Brisbane and Melbourne and how slow and ploddy it is. Apparently there are plans to upgrade to high speed at some stratospheric cost? Very interesting it was, especially the names of the stops along the way. Yes, the train between Brisbane and Melbourne is a slow and a rather expensive trip. It’s not the best way to see the country or visit those unique sounding place names! Great, I’m glad you liked the garden Anna. I find if I am going down the jaded and negative route it’s best to stop writing. I don’t think readers warm to these kind of posts and I want to feel uplifted when I write too. I am sorry the Seattle Show wasn’t more memorable though. That’s a pity when you made the effort to get there. Jump on a plane next year and come to Chelsea. You won’t be disappointed! A great review, Dan. I do wish you did more garden reviews throughout the year! It’s really interesting to read your take on this one and whilst we clearly felt differently about it at an emotional level, I agree with everything you have said. I guess the difference for me was having lived in a dry country it didn’t seem quite so ‘scrubby’ of lacking in sense of place. I look forward to reading your next review; like you, I’m struggling to keep up with all the blog posts I’d like to write about the show. Oh, and thanks for identifying Jaborosa integrifolia; I hadn’t got as far as working my way through the plant list, but this one was a real ‘star’ of the show, wasn’t it! I try to do more Janna but it’s the age old conundrum of how to divide time between visiting gardens, writing about gardens, doing my own garden and writing about that! There just aren’t enough hours in the day 🙂 Today, doing my own garden gets priority. I am working on Beauty of Mathematics next, but there’s so many more I’d like to cover properly. And I have some pretty good snaps to share this year. I think I need an assistant … or to retire and do this full-time? Happy I could help with the Jaborosa. Have a lovely long weekend! He told me what he thought it was all about on Tuesday morning, but I am not sure he had received the feedback directly at that point. I’ll drop you a line. Poor man must be absolutely knackered by now. My back hasn’t recovered from 2 days, let alone 30 something! Thanks for your incisive and informed comments! I haven’t been this year. Conscious decision based on cost and whatnot, but I have found the TV coverage too frothy and insubstantial, so thanks for your thoughts. I have grown isoplexis from seed but, 3 years on, no flowers yet! Maybe it’s me! Missing the buzz of it, I must say…but think what I can do with the spare cash!! Thanks Dan. 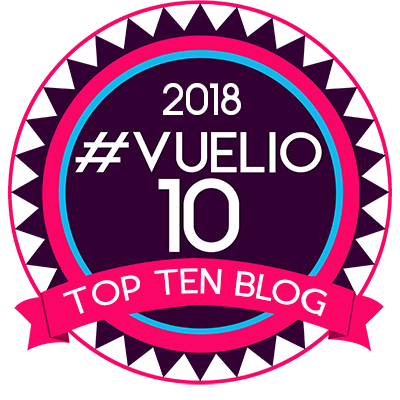 As one of your long distance followers (Australia) I am very appreciate of your excellent writing skills and love your blog. I am very obviously dependant on the reviews of those able to experience the great Chelsea first hand so my opinion may not be relevant; however, from what I have seen in pictures or on utube in this case I could not agree with your comments more strongly. 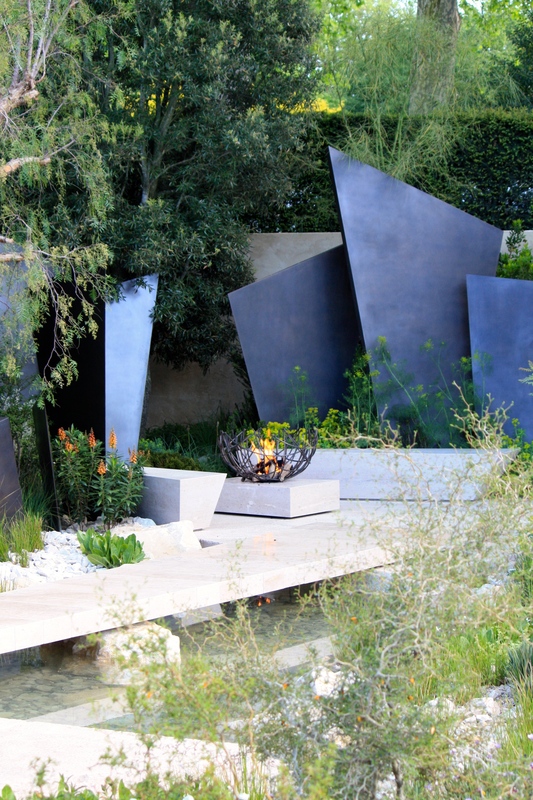 While this is undoubtedly a good garden…perhaps great from a show designers perspective it is not in my view a gardener’s garden..it did not engage me at all apart from as you have pointed out a few of the plants, oh and the fire bowl. I find myself a bit out of fashion it seems and still rate gardens on the basis of their planting primarily not their hard landscaping. But this is a trend reflected across the world where there appears to be an imbalance where the hardscape out dies the softscape. Too true. I am not a fan of too much hard landscaping, unless that’s the only option or it’s a very heavily used public space. It was especially good to see two show gardens that featured lawns again this year. They had almost completely disappeared from Chelsea. I am comfortable with trends in garden design, but not fashion. A garden is too much of an enduring thing to respond to fashion, and if fashion is followed one risks being outmoded very quickly. Responding to trends is a good way of keeping the garden fresh and updated without making expensive mistakes. Lovely to hear from you all the way around the globe in Australia! Isoplexis fabulous if a bit tender to Grow! It reminds me of a rocky, futuristic planet from star trek. Good analogy. Quite a friendly planet I’d say. Chelsea is something of a universe in its own right! !